After finishing your final exam/quiz online or attending a live training, it’s important you follow each step of the rollout process to ensure a fruitful and successful implementation of Witness to Love. 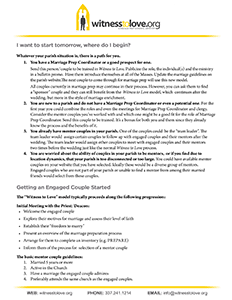 You may want to use this simple Parish Rollout Checklist as you work through implementation. Discuss the first page of your Parish Snapshot with your pastor and then identify your WTL parish team. Note that the team should include everyone who will continue to have contact with the engaged couple or their mentors. In a small parish the team may be 1-3 people but in a large parish of twenty or more weddings a year it may be 3-10 people. Every person that you would like on the team does not need to be identified prior to implementing WTL but all obvious team members should gather at least once prior to rollout. Potential people to invite are: Clergy, parish staff who have contact with engaged couples (e.g., secretary, wedding coordinator), volunteers, traditional mentor couples, marriage counselors, evangelists and couples you would consider as “showcase” mentor couples should an engaged couple not know anyone to ask. after ordering to make sure you received your order confirmation. We will email you a parish-specific online course app invitation link. 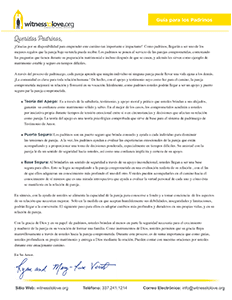 Print off extra copies of the WTL Info Piece English or the WTL Info Piece Spanish. 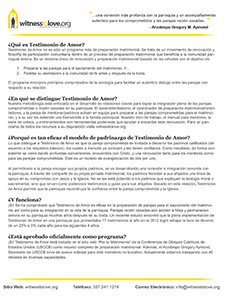 Also, the WTL Mentors Guide in Spanish or the WTL Mentors Guide in English to give out with their copy of the workbook. Gather together all who need to be part of the rollout team. This includes anyone who has contact with the engaged couples or their mentors. 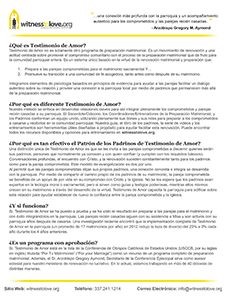 You are welcome to use the WTL Info Spanish or WTL Info English overview handout to introduce the team to WTL. 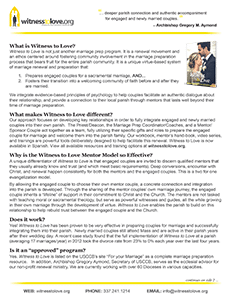 You are also welcome to use this Prezi presentation if you will be recruiting “showcase couples,” to catch other volunteers who are not trained up to speed, or if you are bringing current mentor couples onto the WTL roll out team. Please click through the Prezi and pause all videos so that they can load fully before you present. Choose a Sunday to officially kick-off WTL in your parish. 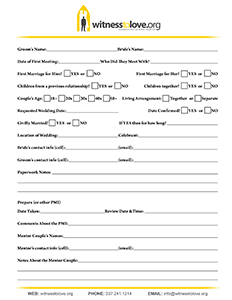 You will want to put a link to our website on your website. If you would like to use our logo please contact us. 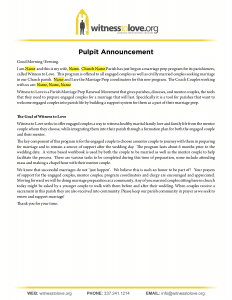 Make this announcement your own and choose a weekend to announce your new Marriage Prep Process. 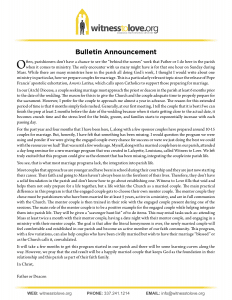 Ultimately you are inviting the entire parish to be involved in the marriage prep process. Marriage Prep becomes a uniting community effort. 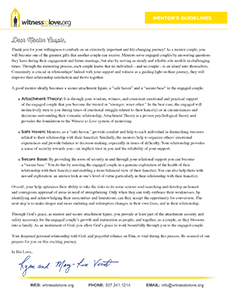 Office personnel may give the engaged couple the Parish Letter for Engaged Couples to inform and facilitate with next steps regarding parish marriage formation. 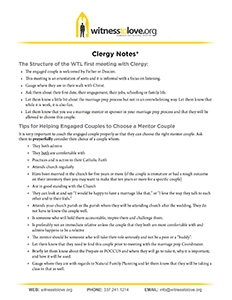 Print off and give to every priest or deacon the WTL Clergy Notes so that they can help the couple to discern the best mentor couple. 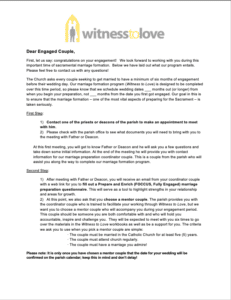 Father or Deacon will fill out the Witness to Love Intake Sheet within one hour of his first meeting with an engaged couple and give it to the Marriage Prep Coordinator. 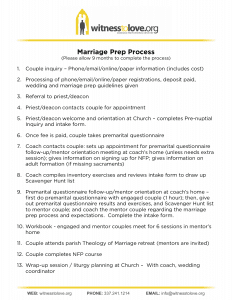 The Marriage Prep Coordinator will add notes to it as well and return it to Father or Deacon after the initial coaching session with both couples. 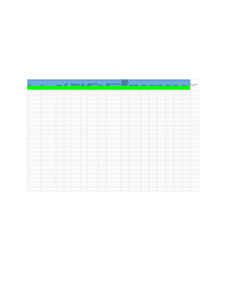 Save this Engaged Couple Spreadsheet as a Google Doc and then you can customize it for your parish and share it with team members so that you can keep track of your engaged couples. The Marriage Prep Coordinator may use this Witness to Love Cheat Sheet during their first few meetings to make sure they cover everything. Use it exactly as laid out until you are comfortable with the process. After the Marriage Prep Coordinator meets for the first time with the engaged couple and their mentors for the initial coaching session a follow up email is sent. 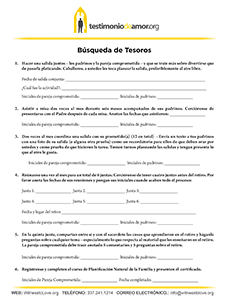 You may edit the Sample Emails (Word Document) and then also edit and attach a personalized Scavenger Hunt List (Word Document) or Spanish Scavenger Hunt to be completed before the wedding. 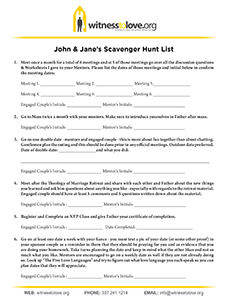 The completed Scavenger Hunt List is turned in at the final meeting one month before the wedding with the Marriage Prep Coordinator or the Parish Marriage Enrichment Coordinator or with the priest or deacon. All options will work. Expect the first meeting to take 60-70 minutes. Add 60 minutes to that if you will be covering their Prepare/FOCCUS/Fully Engaged with them prior to the mentors arriving. 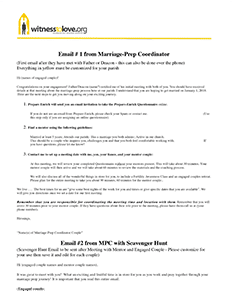 Make sure to email them the parish-specific app invitation link and their Scavenger Hunt after you meet with them using the sample email outline in Step 5. 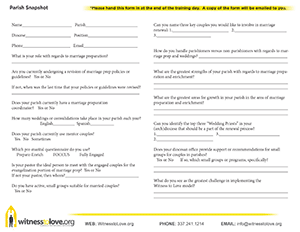 Make sure to utilize the information collected in the Welcome to Parish Life Survey (automatically sent from our website to the parish WTL Marriage Prep Coordinator’s email address when both couples have completed their 6 meetings). Couples should be invited to small groups with in the parish as soon as possible. 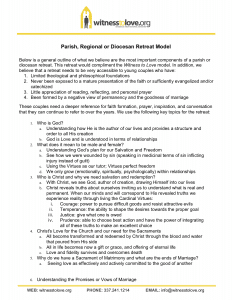 If a marriage prep retreat is held at the parish the small group leaders in the parish should be introduced at the retreat. Great job! You’ve taken the first steps towards renewing the church through relationships! Now help us spread the word!